Bathrooms, though functional and an essential part of the home, are often so much more. A temple of relaxation, where you can enjoy a moment of peace. 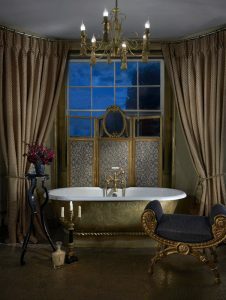 Perhaps the bathroom is the one room in the house where you are guaranteed not to be disturbed; when you can wash away the day’s stresses or have a good old soak in the tub. It is certainly a private space and bathroom blinds are a must have. 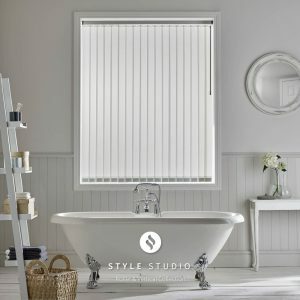 What are the best blinds for bathrooms? 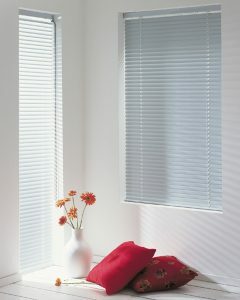 As well as being essential for privacy, blinds also help keep the room cool on sunny days. Some of the best bathroom blinds are made from moisture-resistant fabric, which won’t absorb the dampness in the atmosphere. Due to the combination of water and heat in a bathroom, excess moisture can be an issue. Also, the increasing use of showers and wet rooms in our homes creates more steam build-up. 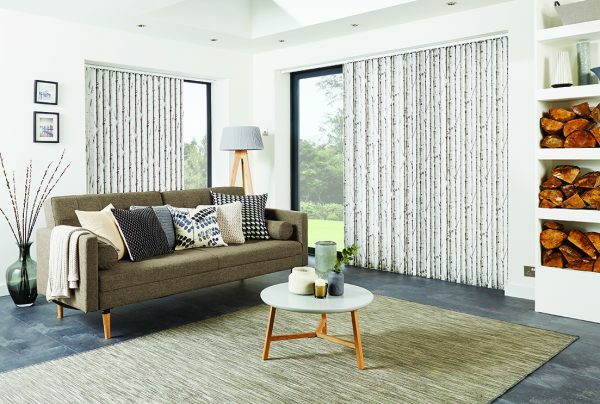 Specialist fabrics that repel moisture are available in a range of colours, and we will always advise you of the best choices when we visit you to measure your windows and discuss your blinds. 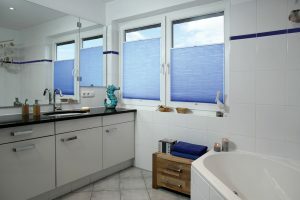 Popular bathroom blind types: Roller, Vertical or Venetian? 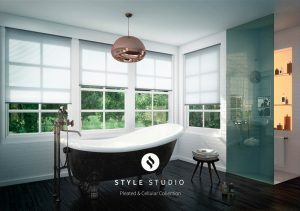 Roller blinds are an excellent choice for the bathroom; they are stylish, easy to use, and effective. Roller blinds offer full privacy when closed and can also block light. A major plus is that they are easy to clean. You can customise your roller blind, for example, choose spring or rollacord mechanisms, in white, brown, black or chrome. Vertical blinds offer the ultimate light and privacy control, as they are fully adjustable. We offer high-quality headrails in silver, white, black, champagne or brown to match your design scheme. These blinds, with their contemporary feel, are a popular option. Venetian blinds can be closed to offer maximum privacy and angled to let in as much or as little light as you like. Aluminium venetian blinds are durable and suit all room conditions. Choose from a wide range of colours and finishes, plain, textured, patterned, perforated and metallic. 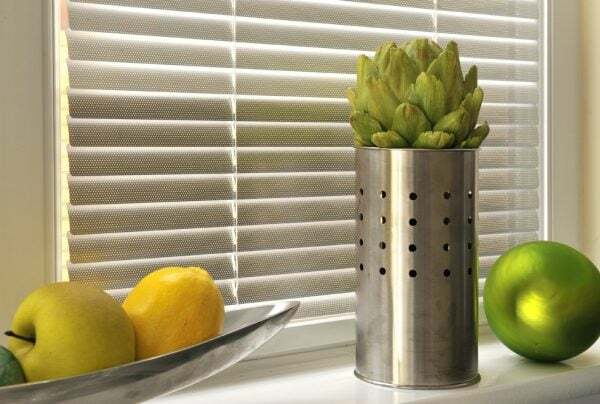 Pleated blinds are a great solution if you have unusual shaped windows. Heat-efficient and light-reducing fabrics are available, which means that pleated blinds can help keep your bathroom warm and cosy. 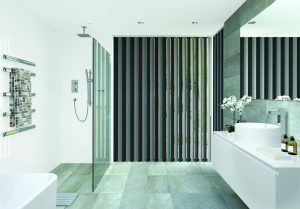 Bathroom Blinds: Are you a traditionalist or a modernist? Gone are the days when bathroom blinds are purely functional and look the same. Once you’ve established the type you want to go for, the world is your oyster design-wise. Opulence or contemporary chic – you decide. 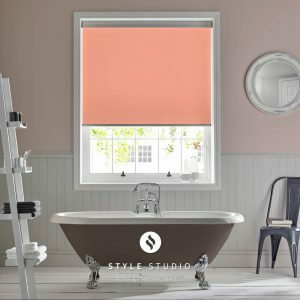 Add a chic understated blind to enhance a minimalist bathroom. Colour is an ideal way to make a design statement and inject some personality. 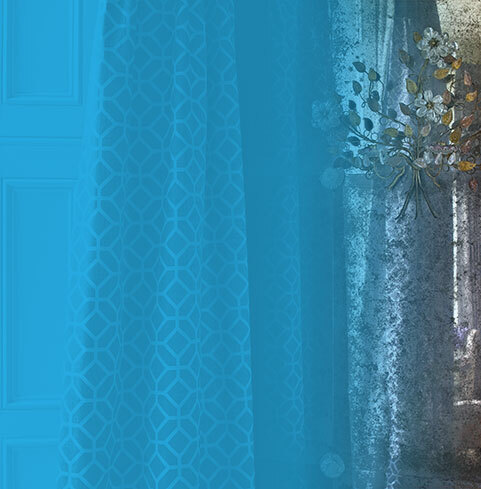 Add a yellow blind for a welcoming, upbeat atmosphere, whereas blue tones create a calm, tranquil tone. 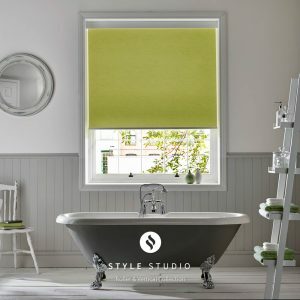 A vibrant blind is a great way to introduce colour to smaller spaces such as a shower room or WC. Choose a colour to reflect your style and personality. Perfect fit pleated bathroom blinds: accents of blue add a calm note. Is your bathroom in need of a revamp but you don’t want to splash out on new units? 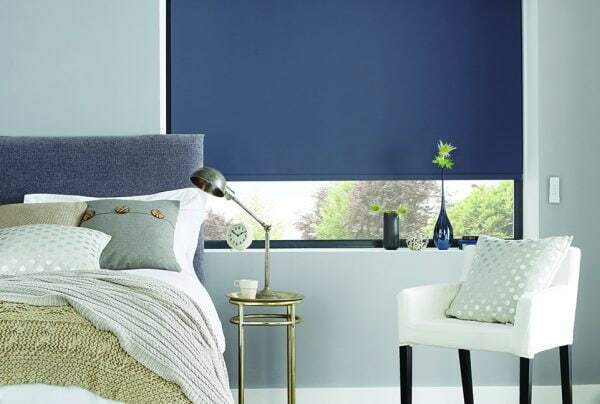 Adding a blind is a great way to update your décor, or if you like to change the look regularly without breaking the bank. By adding a bright colour or pattern you can immediately freshen up the room and give it a new look and feel. Add a couple of accessories to tone in with your new bathroom blind – a towel, cushion, soap dish or handwash! 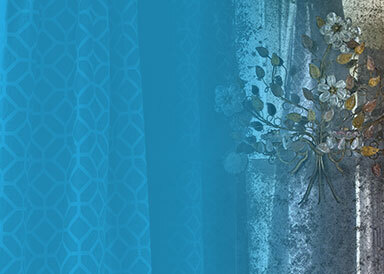 We offer a wide array of gorgeous colours and patterns to complement your bathroom. A splash of lime adds zest to the décor! At the time of writing the sun is shining and the butterflies are out in force. 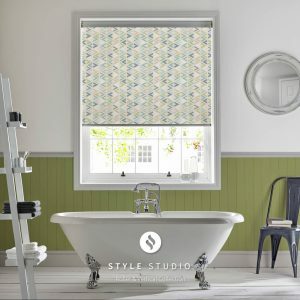 Why not bring the outside in with our selection of stylish bright and cheery bathroom blinds inspired by nature? Add a pop of colour to brighten up the space – a lime green or coral tone. 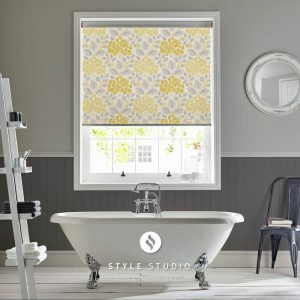 A vibrant bathroom blind will ensure that on even the darkest days you can enjoy a bright space. All our blinds are made in-house by our experienced craftspeople. 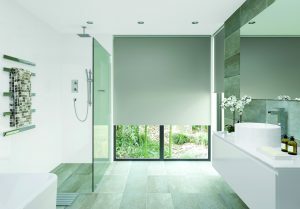 Whether you are looking for a blind for a bathroom, wet room, en-suite or WC, Norwich Sunblinds can help. We visit you to measure up and fit your blinds, as long as you are in or near Norfolk. All our blinds have a 5-year guarantee, giving you peace of mind. Book your appointment for our free measuring service. There is a huge selection of fabrics and finishes for bathroom blinds, including contemporary and traditional designs; it can be overwhelming. The expert team at Norwich Sunblinds are happy to help. Call or book your appointment online or visit one of our showrooms. Get in touch – we’d love to create your perfect bathroom blind.